So you may have noticed that there are days here and there where I haven't been able to post. Trying to manage my full-time "real" job and family, which includes twin two-year-olds, isn't always easy. Combine that with trying to build and improve on AFOMFT and, well, some days I just need an extra set of hands! So I've decided it's time to add someone to the team and I thought what better place to look than to my favorite people - all of you who read the blog! Someone who's organized and a self-starter. Someone who's interested in blogging but doesn't have a blog that currently covers the same topics as AFOMFT (reviews, features and giveaways on products for babies and kids). Having a personal blog is not a problem. Someone who may be interested in contributing posts to AFOMFT - this is a plus but isn't required. Someone who has a general understanding of Blogger. 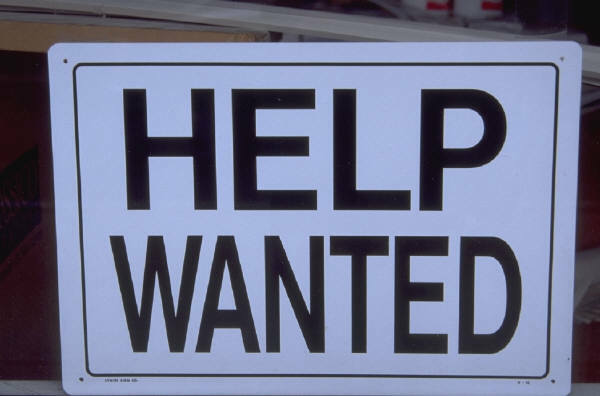 This isn't a paid position but there will be perks for the person chosen which I will disclose in more detail to the candidates I interview. If you're interested in applying, simply fill out the form below and your responses will be entered into a private spreadsheet. Looking forward to introducing our newest team member very soon! Congratulations RAREYES! You've won the personalized Halloween Stickers from Pear Tree Greetings! I can't wait to see which ones you choose. Maybe a design with a photo? Even if you didn't win, we still have a treat for you! For the month of September, Pear Tree Greetings is offering readers of AFOMFT 10% off any Halloween related purchase with code PEARSEP10. Happy shopping! Congratulations MELISSA & NICK! You've won the crocheted headband and newsboy cap from Bows 2 Cute! They're so perfect for fall! Please e-mail me at afomft@gmail.com by end of day Wednesday, September 29th to claim your prize. If I do not hear from you by then, a new winner will be chosen. A huge thank you to Bows 2 Cute for this wonderful giveaway! Congratulations KAT! You've won an adorable hand-painted Initial Hairclip Holder from Ashley Petite! I can't believe it's been almost two weeks since Gabrielle and Alaina's party! It was a fabulous day and I can't wait to share all of the details with you. We live in New York City so where to have the party was a bit of a debate. We had the girls' first birthday on our roof deck which was gorgeous but with 15 kids between one and three coming this time, we decided a local play space would be a better plan. We chose a spot called City Treehouse and it was just perfect. They have a huge Treehouse with a slide that the kids loved (and I did too!). And a gigantic water table that kept everybody happily - if a bit wetly - occupied. We didn't have a real theme for the party but everything revolved around the great graphics that Maureen and Adria from Anders Ruff created for us. I cannot rave enough about working with these wonderful ladies! I had very specific ideas of what I wanted for the party but never could have brought them to life without Anders Ruff. They are creative, patient (I'm a bit of a perfectionist) and so so flexible, and collaborating with them was a lot of fun. 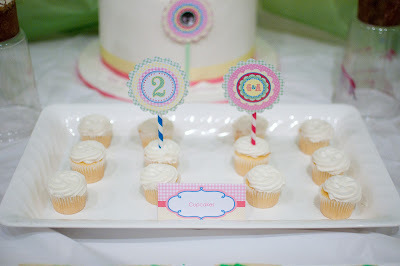 So for Gabrielle and Alaina's "themeless" party, I knew I wanted to incorporate gingham, ric rac, poppy colors and the phrase "Peek-a-boo, Look Who's Two!" Weird combination, I know, but Anders Ruff managed to make it all work. You can see how all of the elements came together with the invitations. The address labels had a spin on the "Peek-a-boo" saying and I couldn't resist adding a personalized stamp! The return address labels featured a layered flower that became one of the main graphics for the party. The invitation itself turned out even better than I ever imagined. After lots of e-mail back and forth, Maureen, Adria and I came up with the idea to play off of the "Peek-a-boo" idea by hiding the girls' picture and some of the party information with a 3-D element on the invitation. This is what guests saw when they pulled it out of the envelope. And here's what it looked like when the ribbon came off. Okay, so back to the party! Gabrielle and Alaina's outfits tied in with the gingham theme. Sara from Peanut & Pumpkin Design made the girls onesies with their initials on layered flowers to match the ones on their invitations. 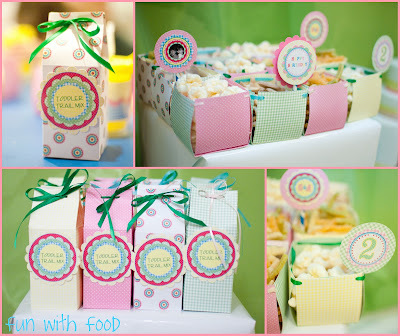 And we paired them with the cutest custom ruffled gingham bloomers from Three Yellow Starfish. Oh, no shoes are allowed in the play space, hence the bare feet! It was time to hit the party room for snacks and cake. 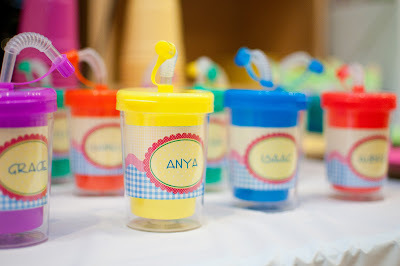 There were personalized sippies waiting for all of the kids. 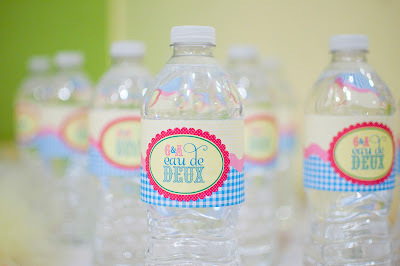 And "Eau de Deux" for the adults. I had a lot of fun making the paper flower bouquets that decorated the table. I'll share a tutorial on these next week but I have to give a huge thanks to my mom for coming up with the great idea to fill the vases with Fruit Loops. Not only did the cereal hold the flowers in place but it looked really cute too. 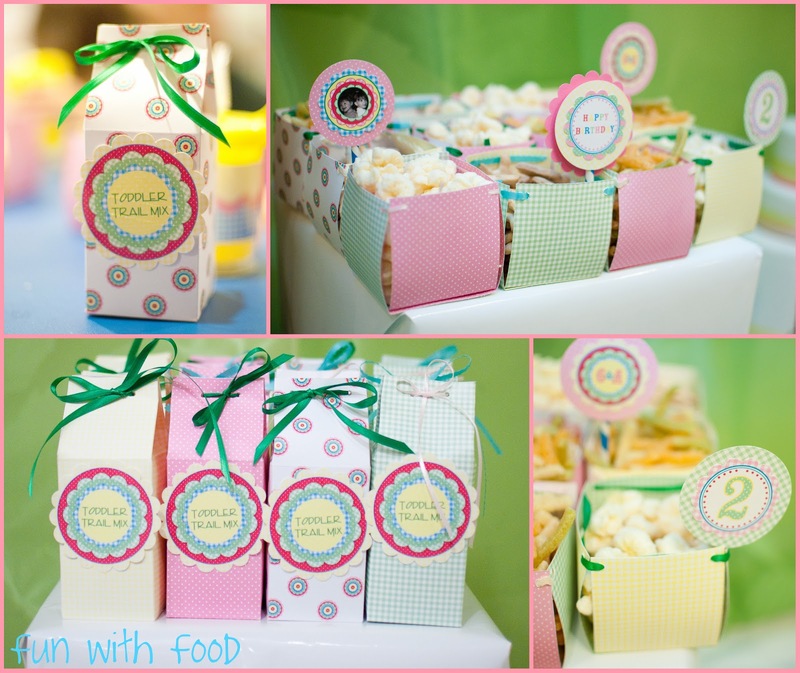 Since most of the party guests were toddlers, I didn't want to go too overboard on the sugar so I used patterned paper that matched our graphics to make boxes for Toddler Trail Mix (Cheerios, raisins and Goldfish) and little containers we filled with Veggie Sticks, animal crackers and cheese puffs. 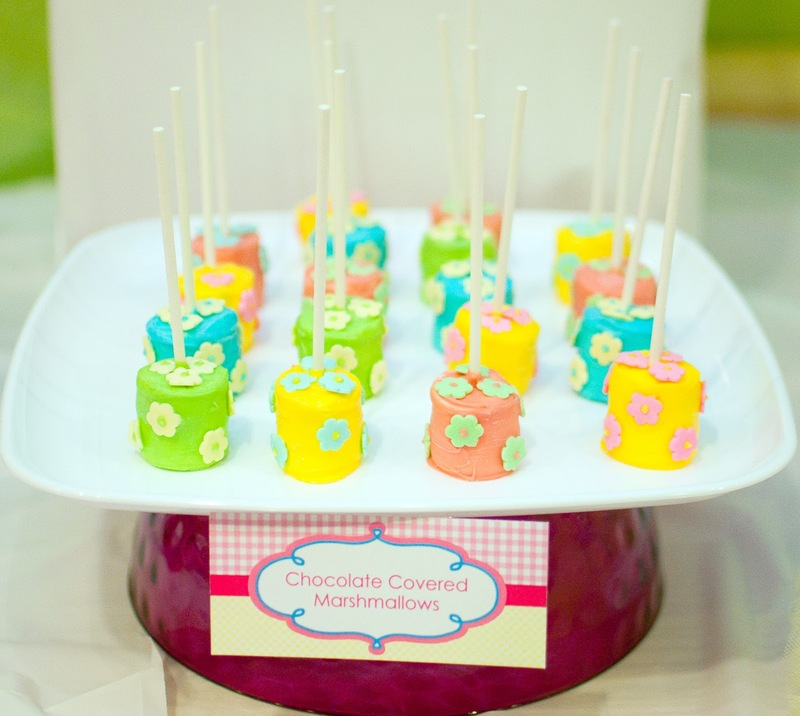 But there were sweet treats too! The mini-cupcakes were store bought from Whole Foods and dressed up with toppers (I used paper straws instead of lollipop sticks to make them pop a little more). 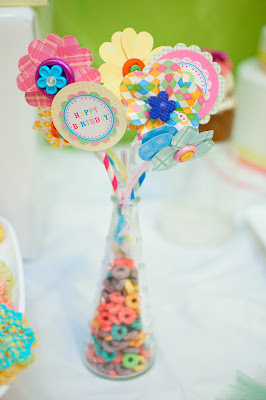 Ally from Girly Gatherings did an AMAZING job transforming the logos from Anders Ruff into cookies. They were almost too cute to eat. Almost! And I was planning on making chocolate covered marshmallows and Rice Krispie Treats but when Jairy from J's Sweet Art volunteered her services, I couldn't say no. I love how the marshmallows had little flowers on them that matched our graphics. And some of the Rice Krispie Treats had chocolate "gingham." Miriam from BCakeNY took the graphics and used them on this delicious and darling confection that I hated to even cut into. But boy was it worth it. After two hours of water tables and slides and treats galore, the party was over. 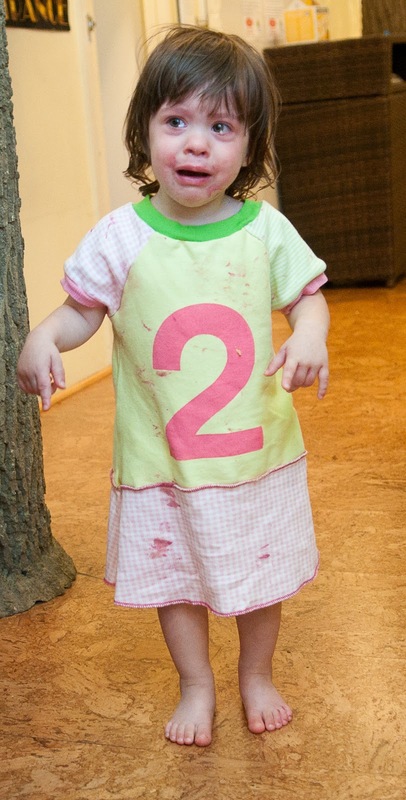 But one of the birthday girls (in her custom made dress from Nookie Scooter) didn't want to leave. Stay tuned for tutorials next week on how to make the paper flower bouquets, the trail mix boxes and snack containers as well as the scoop on what was inside the personalized tote bags we gave out as favors. We'll also have some giveaways for you from the vendors who helped me pull this party together. I can't close this post without thanking Maureen & Adria from Anders Ruff, Ally from Girly Gatherings, Jairy from J's Sweet Art, Miriam from BCakeNY and last but not least, our photographer Ryan Trupp for capturing all of the moments and details for us! When Gabrielle and Alaina surprised us by arriving 12 weeks early, my husband and I started a blog called And Babies Make Four.... to keep all of our friends and family updated on their progress. The first few months of their lives were spent in the NICU, where we experienced some amazing moments as well as some truly terrifying ones. Our family blog was an outlet for us during that time and I'm so glad that we have that record of everything we went through. After both girls came home, I continued to post on the blog but with less and less frequency, and by their first birthday, Facebook became the place where we shared our pictures and updated on new milestones and achievements. But the thing about Facebook is that I can't easily look back and see when Gaby took her first step or figure out when Alaina said her first phrase. I really regret not posting more regularly on our blog so all things Gabrielle and Alain could be contained in one place. Lucky for me, there's a way to assemble everything just the way I want it. 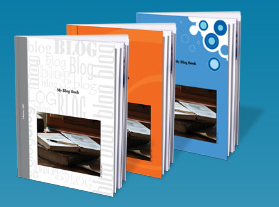 When Gabrielle and Alaina turned two, I decided that I would have our blog made into a book for them through Blog2Print, a website that transfers blogs on Blogger, Wordpress and Typepad into books. It's such a simple process - enter in your URL, choose a cover design and whether you want a hard cover or soft cover and you're on your way. You can include every post and picture or pick and choose (you can re-order them, too) and I love that you can also include the comments people left in your book as well. I laid out more than 100 posts in no time. But remember when I mentioned being able to incorporate all of the things I'd posted on Facebook instead of the blog? That's where Everything2Print comes in. On this site, you can access your Facebook photos, status updates, notes and more, and choose to include any of that information in your book. 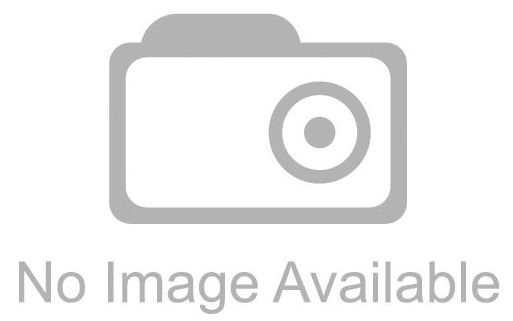 In addition, you can add Twitter updates, pictures from Picasa, Word documents and PDFs. When they named the site Everything2Print, they weren't kidding! So all of those little things I posted on Facebook - funny moments, silly comments, etc. - are a part of our book now, too. I am so excited to get my bound version of And Babies Make Four.... and I'll post pictures here once it arrives. Just putting it together and reading all of the blog posts and messages we received made me extremely emotional. Thanks to Everything2Print, someday we'll be able to sit down with Gabrielle and Alaina and read them the story of their miraculous road from 2 pound preemies to healthy, happy little girls without missing a step along the way. Now I've learned my lesson and vow to get back to posting all about the girls on our blog. But just in case I don't and slip back to my Facebook ways, I'm glad to know that those memories won't be lost. Please leave a separate comment for each entry (two if you've blogged about the giveaway) and make sure to include a link to your tweet, blog post, etc. All entries must be posted on AFOMFT as a direct comment to this post. Comments on Facebook will not count as entries. This giveaway is open to residents of the U.S. and Canada and ends September 30th at 11:59 pm EST. The winners will be selected by random.org and announced on AFOMFT on October 1st. If the winners don't contact AFOMFT within 48 hours, a new drawing will be held so be sure to check back to see if you've won! Halloween is just 41 days away! Have you started planning something spooktacular yet? No?! Me either. Lucky for both of us, Peartree Greetings has got us covered. I'm one of those moms who loves to commemorate every holiday (like I did on Valentine's Day) so when I saw Peartree's line of Halloween cards, I knew I had to have some. I love the striped postcard. And the Halloween stamp design that lets your little one take center stage. The Trick or Treat card is perfect for a princess or a fairy. And nothing says Halloween like a big ole BOO. Now I just have to decide on costumes for the girls and get a decent picture of the two of them in those as-yet-unknown get ups. I better get on that! If you are planning a frightening fete, Peartree has invitations that will set just the right tone for it. This one is eye-opening. The tombstone will rouse even the deadliest guest. Here's something sassy for your Witches' Night out. And your little ghoul will love this monster mash up. And last but not least, I know you're going to love these terrifyingly awesome stickers. You can personalize them with a message or your address and use them in so many ways- as return address labels or on party favors, treat bags, cups, plates - anything you want to give a little spooky style. This vampire design is fun for kids. And I'm scared silly by the Frankenstein version. Oh my! You an even personalize them with a photo. Priced at just $2.99 per sheet of 12, they're an easy and inexpensive way to give your Halloween goodies some creepy cuteness. Post a comment telling me what your little one(s) will be for Halloween. Please leave a separate comment for each entry (two if you've blogged about the giveaway) and make sure to include a link to your tweet, blog post, etc. All entries must be posted on AFOMFT as a direct comment to this post. Comments on Facebook will not count as entries. This giveaway is open to residents of the U.S. and Canada and ends September 27th at 11:59 pm EST. The winners will be selected by random.org and announced on AFOMFT on September 28th. If the winners don't contact AFOMFT within 48 hours, a new drawing will be held so be sure to check back to see if you've won! And that's not all! For the month of September, Pear Tree Greetings is offering readers of AFOMFT 10% off any Halloween related purchase with code PEARSEP10. Happy shopping!